Have you ever heard of winter asthma? Even if you have never before heard the term, that doesn’t necessarily mean you haven’t suffered from it. People with asthma know: there are some surprising things that can trigger their asthma and make breathing much harder for them. Winter time (as well as other seasons) and the cold air that comes with it is just one of those things. In this article, we’ll explain everything you need to know about winter asthma, as well as how to tell if you might have it and also some tips for what you can do about it. We’ll also share helpful information such as the best asthma prescriptions and asthma medications, so you can take precautions for your asthma and make sure to take your health and asthma treatment into your own hands. In other words, both environmental factors and the coldness of the air itself can trigger an asthma attack for people who suffer from winter asthma. Different people suffer from different asthma triggers. For some, it’s pets or pet dander, changes in season, or other irritants like dust or pollen. However, for some, the coldness of the air in wintertime can be a serious asthma trigger. In addition, wintertime is cold and flu season. These illnesses can be very irritating to the respiratory system, leading to flare-ups for asthma sufferers. In fact, any factor that affects the lungs or breathing can be a trigger for asthma. So, essentially, any weather condition that affects the air quality or temperature can also affect your lungs, and therefore your asthma. It makes sense, but many people do not realize how much of an effect winter time can have on their asthma. If you find yourself suffering from more severe or more frequent asthma attacks, the winter weather may be to blame. You may be suffering from winter asthma. The good news with winter asthma is that like all types of asthma, there are things you can do to prevent and treat it. Drinking plenty of fluids can help, as can staying inside and staying warm! Breathing humidified, temperature controlled air may be a major relief, as long as it is not swirling with dust or mold spores, as can sometimes be the case in indoor environments. For temporary relief, a hot cup of soup or even tea with lemon and honey may be just the thing you need to soothe your suffering respiratory system. To prevent winter asthma, Self recommends getting your flu vaccine before winter hits, washing your hands regularly to prevent the spread of illness (and avoiding the possibility of an upper respiratory infection, which can greatly exacerbate winter asthma), doing your best to breathe through your nose instead of your mouth when you go outside, covering your nose and mouth with a scarf when you go outside, using a humidifier at night, and exercising regularly while also making sure you do not flare up your asthma. Another thing you may not think about--but that can be a major factor in asthma treatment--is replacing the filters of your home and cleaning the air ducts. Eliminating as much dust and debris from the air as you can will help ward off asthma triggers all the more. Your home’s heating or cooling system may blow dust and other irritants to circulate throughout your house, especially when you turn it on again for the first time in a season. Cleaning and replacing your air filters before cranking up the heat again can really help prevent an asthma attack because it gets rid of all the airborne pollutants you’d otherwise be exposing yourself to. When it comes to exercise, you don’t want to use winter time as an excuse to stop working out, but it’s also important to realize that straining your lungs and breathing heavy usually doesn’t help your asthma. However, there are ways to go about it that can make sure it doesn’t hinder and only helps. For example, exercising indoors--say, at a gym--is probably a better idea than going for a run in the freezing cold if you have asthma. In addition, warming up before you begin your workout can be a key factor in preventing an asthma attack. Taking preventative doses of your asthma medications can also help, depending on the instructions and advice of your doctor. Above all, you can take all the preventative steps possible, but taking your asthma medication is a vital step in preventing an asthma attack and keeping your asthma at bay. Ask your doctor if taking preventative doses of your asthma prescription before strenuous activities like walking, running, or heading outside may be able to help you. In addition, you should have an asthma action plan in place so that you know what to do if and when an asthma attack hits. Knowing how to control your asthma and also the steps to take if you get hit with an asthma attack is essential. Talk this over with your doctor and make sure to have a clearly laid out plan for your health. Stay up to date with regular checkups and keep up with your asthma medications so that you do your part to prevent the onset of asthma attacks as much as possible. The most common form of asthma treatment is inhalation therapy, which we’ll cover in more detail in the next section. However, there are also asthma medications like oral asthma drugs and other forms of treatment you should know about if you suffer from winter asthma or any type of asthma. According to the Mayo Clinic, “Many people with asthma need to take long-term control medications daily, even when they don’t have symptoms.” Some of these long-term asthma control medications include inhaled corticosteroids such as Fluticasone (Flovent HFA), Budesonide (Pulmicort Inhaler), Mometasone (Asmanex Twisthaler), Beclomethasone (Qvar RediHaler), and Ciclesonide (Alvesco); leukotriene modifiers such as Montelukast (Singulair), and Zafirlukast (Accolate); long-acting beta agonists (salmeterol, or Serevent, is the most common); and theophylline, which is a bronchodilator that you take daily in pill form. Other inhaled asthma medications--like Fluticasone and salmeterol (Advair Diskus), Budesonide and formoterol (Symbicort Turbulaher), Mometasone and formoterol (Dulera), and Fluticasone and vilanterol (Breo)--are combination treatments that contain both a corticosteroid and a bronchodilator. 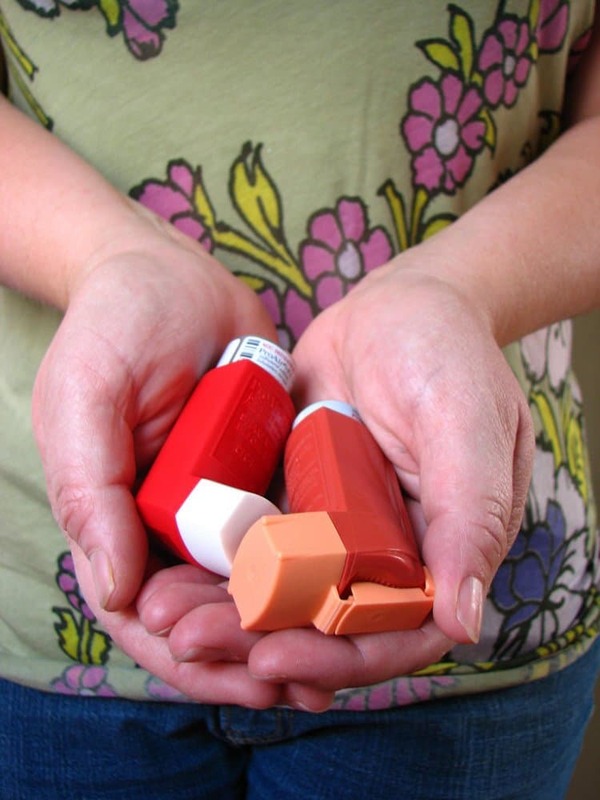 Medications for quick asthma relief include Albuterol (ProAir HFA, Ventolin, and more) and Levalbuterol (Xopenex HFA). Inhalation therapy: are you doing it right? If you suffer from asthma, you likely treat your condition with some form of inhalation therapy. However, at times, patients fail to conduct their inhalation therapy properly, which can lead to results that are not optimal. According to a study published on MD Edge, “For patients with asthma or chronic obstructive pulmonary disease (COPD), inhalation therapy is the foundation of treatment. Yet all too often, patients don’t get the full value of their inhaled medications because they use their inhaler incorrectly. When technique is markedly flawed, suboptimal outcomes typically result. Some common inhaler mistakes include failing to shake the inhaler well, inhaling too rapidly, exhaling too soon, not inhaling deeply enough, leaving the cap on, holding the inhaler upside down (the mouthpiece should be on the bottom! ), and failing to wait long enough before the next puff from the inhaler. In addition to the standard inhaler, other forms of inhalation therapy include inhaled steroids, bronchodilator inhalers, and nebulizer machines, which is an at-home breathing treatment that takes a bit longer than a quick puff from an inhaler. Wondering the best place to get your asthma prescriptions? Whether you are looking for inhalation therapy, oral asthma drugs, or other types of asthma medications, we have you covered. In fact, we have an entire section of our website dedicated to medications that treat asthma and other respiratory disorders. We carry many of the most popular asthma medications on the market, and for a fraction of the price you’ll find from other retailers and pharmacies. No matter which category of asthma treatment methods you’re looking for, we likely have what you need. We offer a very wide range of asthma prescriptions and we offer them at a fair price that you can afford. No matter if your doctor recommends oral asthma drugs, inhalation therapy, or some other type of asthma medication, we have a wide variety available on our site. Best of all, we offer discount asthma medications that you can have shipped straight to your door. If you are looking for discount asthma medications as part of your course of asthma treatment, you’re in the right place. We have been providing our customers with quality products and excellent prices since 2006! We have a long history of dispensing quality asthma medications that are affordable and convenient to acquire. We have dispensed over 200,000 orders and have 500,000 customers across the world. In addition, we offer over 1,000 types of prescription medications and over the counter products, and we offer free shipping within the USA. CanadaPharmacOnline.com is a CIPA member, a Certified Canadian International Pharmacy, and is approved by PharmacyChecker.com. What are you waiting for? Place your asthma prescription order today!